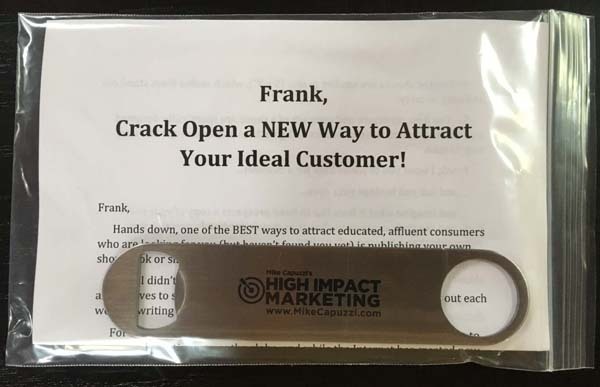 On this episode of 3 in 3, I’m going to share three “thin” direct mail attention grabbers you can use, which don’t add a lot of postage costs to your mailing but do a great job of getting the recipient to open and interact with your mailer. I’ve used all three of them and can vouch they get attention, so get ready for 3 in 3! 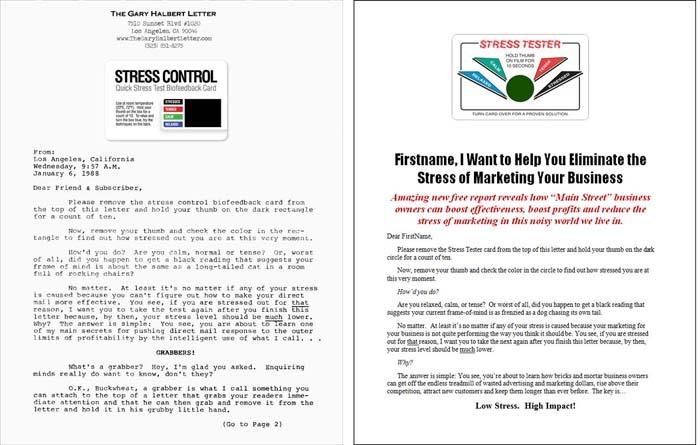 The first direct mail attention-grabber is one I used after seeing the late, great Gary Halbert share his use of it way back in 1988. It’s a custom-printed stress test card, which you can use and stick to the top of your letter to get attention and engagement. I like these cards because they add practically no weight or dimension to your mailing, and it’s almost impossible for somebody to get this and not take off and test their own stress level. There’s an excellent chance your reader feels some level of stress related to buying your product or service, so this card is a great engagement device. This simple little step gives you a better chance your letter will get read. You can find these cards online if you Google custom stress cards. The second attention-grabber is powerful one to use if your product or service plays a small, but important part of something bigger. It’s a little brass hinge which you can attach to a letter or card and remind the recipient that of this powerful concept. This is a good attention-grabber if you are marketing an event and want to remind potential attendees it only takes a few takeaways to make the event worthwhile. Or of you offer any sort of consultation or fact-finding call and how a little bit of time with you can result in big opportunities. You can get these hinges in bulk at www.CraftParts.com and search on item # HG0606. This last attention-grabber is still a thin one, but a bit heavier and will add some cost to your mailing. It’s known as a bartender’s speed bottle opener and being a gadget guy, I like these. It’s a high-quality, useful tool that is Capuzzi-branded and will never get thrown way. 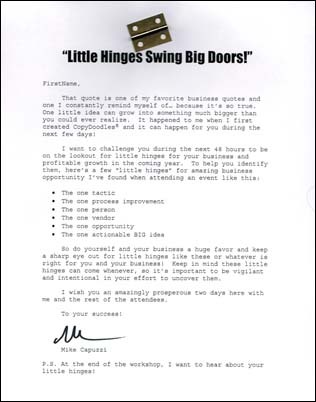 I am sure you can come up with a similar “open up-type” message for your business. Google “bartender’s bottle opener” and you’ll find several promo companies that can supply you with custom-printed openers. I ordered mine from www.AnyPromo.com – item #725628. So that wraps up this episode of 3 in 3. I hope you found these “thin” direct mail attention grabber ideas useful and if you decide to use any of them in your next campaign, let me know what you did. Until next time, keep on marketing!